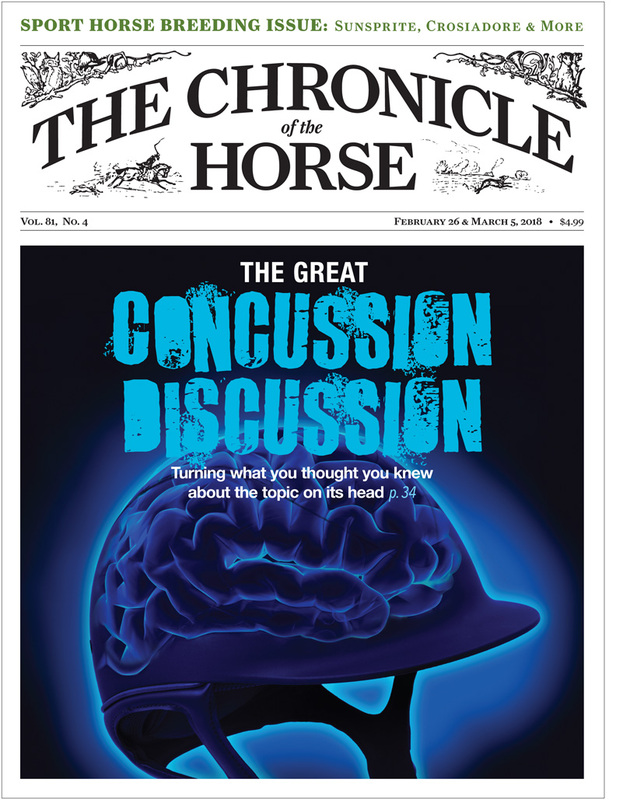 Our exhaustively researched two-part series on head injuries and their prevention was published in the Feb. 26 and March 12 issues of The Chronicle of the Horse. What are you missing if you don’t subscribe? Almost a year ago, the editorial team at the Chronicle decided to write an update on new technologies that prevent head injuries for our Innovations issue. I spent weeks talking to manufacturers, doctors and sport experts until I realized glumly that we had a problem with these technological breakthroughs: There weren’t any. So what started as a story about new technology turned into two exhaustively researched stories about what we do, in fact, know about concussions, and how helmets fit into the picture. Google “concussion technology,” and you’ll get pages and pages of information about sensors in helmets, biomarker testing and other exciting concepts. But none of these privately designed technologies is nearly ready for prime time. Sure concepts like a sensor in a helmet that can tell you when you’re concussed sound great and have gotten an awful lot of mainstream press in the wake of the current concussion crises across many professional team sports—but the development of a functioning helmet using this prototype technology simply hasn’t happened. Then there’s technology like MIPS, the Multi-directional Impact Protection System, a form of slip plane technology that lets the brain slide a bit during a fall to help protect it from a concussion. That technology started in Sweden in the bike helmet world, and it’s grown in popularity and recently come to the U.S. equestrian market. While multiple websites make MIPS sound pretty amazing, nowhere have there been independent studies of what helmets that use MIPS technology actually do or whether they work. It’s confusing because there are studies about concussions that have inspired the MIPS technology, but no studies on the MIPS helmets themselves or how they function in the types of falls common to equestrians. It’s not that the technology is bad or should be avoided, but it’s not been proven to work. So go ahead and buy a helmet that uses MIPS technology if you’d like, but understand you have a prototype, not a helmet that will necessarily prevent concussions the way you hope. So how to improve safety in the age of concussion awareness? First things first: Check your helmet. At the very least let it be fairly new, fit well and have suffered no significant falls. Also, get the safest helmet for what you’re doing. As soon as I hung up with one helmet manufacturer I walked into the office of my co-worker, who’s been running her horse around intermediate tracks and had mentioned she might be in the market for a new helmet. I suggested she get the one on the market that’s popular with eventers and is indeed approved by Snell—the toughest standard around—in addition to ASTM International (the main U.S. body that certifies equestrian helmets). Second, look into concussion training. Experts will simultaneously tell you, “It’s easy to diagnose a concussion,” and, “It’s difficult to diagnose a concussion,” but Chambless explained that a layman can learn to perform a general, overly conservative assessment to determine if the individual needs to go to the hospital. The U.S. Equestrian Federation and the Centers For Disease Control And Prevention have great information and tool kits for diagnosing concussions. Third, take a personal interest in that helmet you’re putting on for every ride. ASTM International, which hasn’t significantly toughened the equestrian helmet standard F1163 in 14 years, is currently considering two additional measures that could make your helmet safer. While this seems like a no-brainer, the helmet manufacturers I talked to said the public doesn’t tend to like these updates; they just don’t want to have to buy a new helmet. Don’t feel this way? Reach out to the committee and let them know. Fourth, when you read a story about concussion technology or a new study, double check the sources. If it’s about a new technology, double check the research for peer reviewed, independent studies before you start spreading the word. Promising technology early in development sounds great, and we need that research. But read carefully to evaluate how far this technology is from being proven scientifically sound before you share that link on Facebook as the next big thing. Fifth, take a second look at that “when you fall off you need to hop right back on” mentality we all grew up with. Slide out of the tack and land on your feet? Probably makes sense to hop on again. Get bucked off and feel a bit shaken? Perhaps give a leg up to another rider and take a break while they school the horse. Sixth, voice your concerns to the sport’s governing bodies. The USEF is taking concussions very seriously, but a rule for the 2019 season that would have mandated concussion training for professionals stalled. When this year’s proposed rule changes hit the internet in the fall, check out which concern concussions and safety, and reach out to the appropriate individuals to express your opinions. Some organizations like the U.S. Hunter Jumper Association make it easy for members to share comments about the rule. Alternatively, you can reach out to the individual or head of the committee sponsoring the rule with your thoughts. 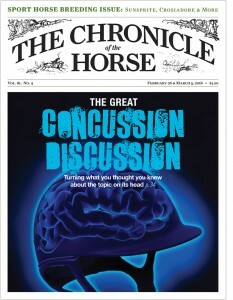 Our two-part series on head injuries and their prevention was published in the Feb. 26 and March 12 issues of The Chronicle of the Horse. What are you missing if you don’t subscribe?